PBJstories: Epic News: A $3000 New Year New Home Giveaway!!! Epic News: A $3000 New Year New Home Giveaway!!! I am here guys! I am here and though I have been quiet lately - I am here ready to scream this exciting news from my rooftop! 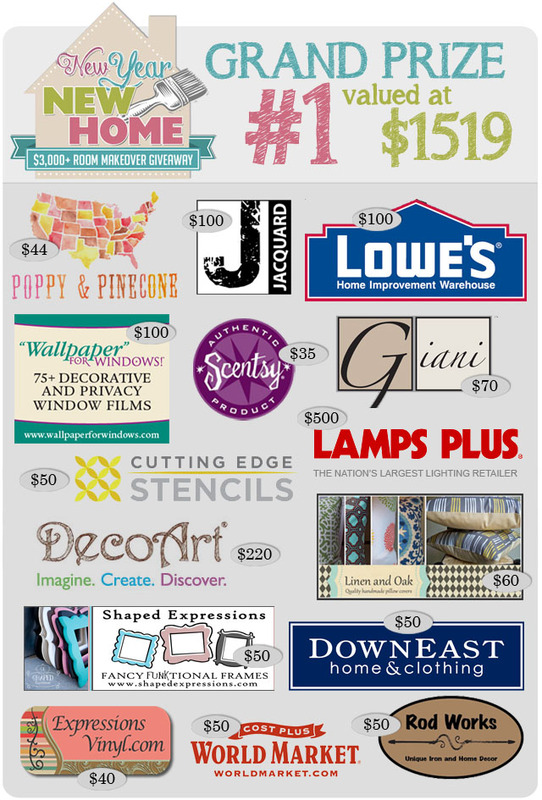 I am bouncing off the walls excited to announce this New Year New Home Room Makeover Giveaway! I'm honored to have teamed together with this amazing group of ladies, and all these awesome companies to bring all this spectacularness to YOU! 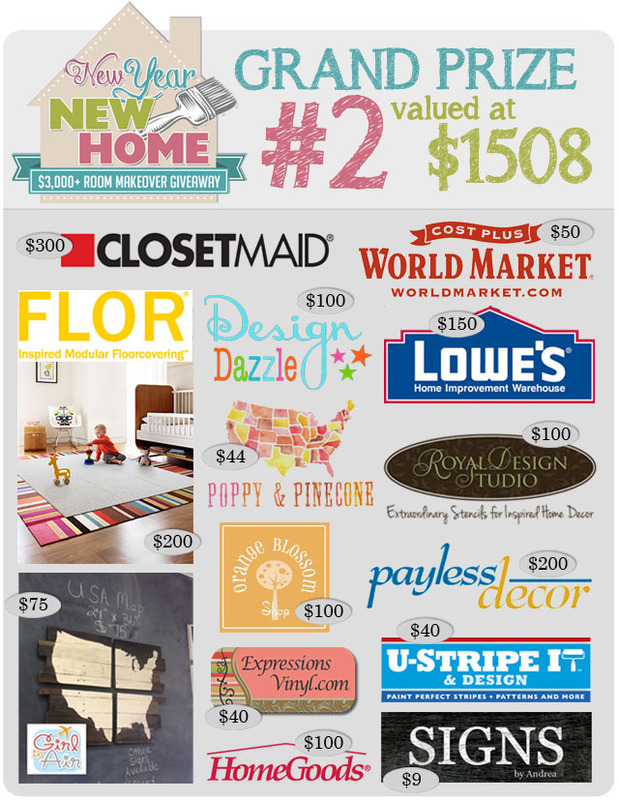 New Year, New Home: $3,000+ ROOM MAKEOVER GIVEAWAY! The prize package is huge (over $3,000!!) and includes everything you will need to update a room in your home! (Or spread the love out and update a few items in a few different rooms...your choice really!) In any case, it's huge, and fabulous and I can't wait to see who wins!! It was SO HUGE we decided to split it into 2 Prize Packages! Enter to win once, and have a chance at winning one of 2 prize packages! Linen and Oak offers meticulously hand crafted home decor and pillows to help make your home beautiful. Lowe's offers everything you need to tackle your home improvement projects all in one place. Unique, authentic and affordable home decor and furniture. Your one-stop shop for all your vinyl and vinyl cutting machine needs at amazingly low prices. Jacquard Products in the leading manufacturer of artist quality textiles, mixed media and and craft products. Wallpaper for Windows offers a wide variety of decorative, frosted and privacy window films to enhance the beauty and privacy of your home. DownEast Home provides stylish and inexpensive home decor items that are sure to make your space into a warm and inviting home. Granite paint to upgrade your counter tops to fabulous in just a few short hours. Lamps Plus has the largest selection of functional and decorative lighting, home accessories and furniture and has been providing great services nationwide for over 30 years. Renew your home with amazing home decor accessories available in store or online. Safe Wickless Flameless Decorative Candles, smokeless and soot free ~ with Scentsy's wickless candle bars and electric warmers, you can enjoy all the sensory delights of scented candles without the dangers of an open flame. Shaped Expressions offers fancy 'funk'tional picture frames in many shapes and sizes, both painted and unpainted to enhance the beauty of your home. Poppy and Pinecones offers original art prints for your home at great prices. DecoArt offers fabulous acrylic paint for artists, crafters and home decorators. ClosetMaid is a worldwide leader in home organization offering design and amazing systems for use in bedrooms, kitchens, family rooms, laundry rooms etc! Payless Decor offers a great selection of window coverings from blinds, to shades and draperies at great prices. Hand-crafted personalized signs for your home and family. Earth-aware consumers can create inspired living spaces through their own, unique composition of FLOR carpet design squares which provide the freedom and flexibility to create striking rug designs of any size or shape for every lifestyle. Extraordinary stencils for inspired home decor. Orange Blossom Shop is a one stop shop for fun and chunky frames, vinyl lettering, digital prints and party supplies. U-Stripe It's kit allows you to paint stripes, plaids and other patterns with ease and simplicity. Etsy and local shop selling handmade home decor, stamped jewelry, hand painted signs and also a retailer for the Silhouette and Annie Sloan Chalk Paint. HomeGoods is a store where savvy shoppers can discover a world of spectacular home products at great prices. So who wants to WIN!?!? 1) Comment on this blog post and tell me which room you would makeover if you won! Then fill out the coordinating mandatory Rafflecopter entry below. Easy peasy. 2) For tons of extra entries, follow the prompts on the Rafflecopter entry form to Follow us ALL on Pinterest! 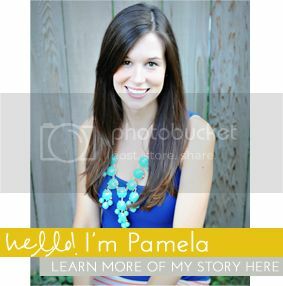 PINTEREST is becoming a household name and many amazing bloggers can be found on it! It is a great way to discover amazing DIY's, crafts, recipes and more etc. and ALL of these fabulous bloggers are must-follows in the world of Pinterest! They all pin (almost) daily and are constantly discovering new and incredible things! If you follow them, you'll be able to discover fabulous things too! Who wouldn't want to follow these amazing ladies!?!?! 3) For even more bonus entries, follow the prompts on the Rafflecopter entry form to Follow us ALL on Facebook! We have pulled together an amazing group of bloggers and you'll be able to keep up on the latest trends, DIY, Craft and other fabulous ideas by following us all on Facebook! I would make over my kitchen! Its white, white, white and needs some love! I would split the makeover between the master bedroom and our living room! Awesome giveaway!! I would love to makeover our living room. Our house burnt down last Aug. Now that we are done rebuilding I need to decorate. This is an AWSOME gives way. I would jazz up our master bedroom and share the love with our living room! What a GREAT giveaway ladies!!! Would LOVE to be a part of this if there is another go around. I would split it between the kitchen and the family room. What an awesome giveaway! Most likely my daughters room. She is getting older and is ready for a bit of an update. This is wonderful!! We just got a fixer upper! The first projects are the kitchen&laundry, and about every other room, too!!! I would use the prize for my master bedroom. We really need a space to relax and call our own. WOW!!!! Talk about awesome!!! I would love to win either prize package and would be thrilled to fix a room in my house....Here is my dilemma - we moved into our new home 2 years ago and since then I have been lost as to what to do in our living room, our family room and the bathroom...And boy do I mean lost! Our living room is used for company or when we want to just sit and read a good book, this room needs help! My other issue is our family room in the basement...This is the room where we spend all of our time! We watch TV, play with the grand kids and enjoy our favorite shows and sports...and last we have our bathroom...We want to be able to put in a walk in shower instead of the big ugly tub we have and I would love to paint the walls and put in a new vanity...So if I had to choose one room it would have to be the family room! This is the room where we spend all of time and we do it together...Thanks again for such an awesome giveaway! I would love to makeover in my master bedroom. It has ugly woodpaneling and the ceiling is in dire need of repair. I would make over our bedroom and 1/2 bathroom to make it a master. Our house is 113 years old in Minneapolis, so the layout is really funky and difficult. This would make our house SO much more functional for my family! Thanks for the opportunity! Our Kitchen. It was our plan to eventually redo the countertops and cabinets. I lost my job so that project has been put on hold indefinitely. I have a lot of rooms on my list. Making over a room for my daughter and turning her old room into new baby's room (due in April). Our bedroom is a hodge-podge mess and don't even get me started on our bathroom! My husband and I just had our little girl 13 days ago, we live in a 1 bedroom apartment and are getting ready to move in the next 6 months, (Out of state, and into a home!). If I were to win, I would decorate little bits of every room in our new home, but especially a nursery - because I haven't been able to have one now, due to the limited space. SOOO excited, and sooo crossing my fingers!!! Our family room is in need of a makeover! This is such a great contest, and perfect timing too! I think my living room could use a big facelift (considering it's filled with very worn hand-me-down furniture for the time being). I would make over my bedroom for sure!! Depending on which one I win really. I would either do our master bedroom/bathroom/closet or our Kitchen area. I will make over my guest room and my keeping room which is on my kitchen. It needs love. I would makeover my bedroom to have a haven for myself! Basically every room in our house needs updated, but I'd probably have to start with the living room since it gets the most traffic. Master bedroom or living room makeover would be amazing! We just bought our home on January 11, 2013 and have started to paint some stuff here and there. We would love to redo our master bedroom or even the converted garage. I would love to makeover my living room or guest room! my redo would be a combination of the living room and kitchen. Both need some serious help!! Probably my girls room. I have been renovating an old third floor room for them and by the time I get done fixing it up there wont be any money left to decorate. I think they may be stuck with the toddler beds forever. I would love to do my living room. We have nothing my house is to lame. I would paint and do all kinds of things to my living room to make it look more like a house. I would definitely do the master bedroom. It never gets love with home improvement budget. I would love to makeover my family room. The room really needs an update! My downstairs family room is in dire need of a makeover but then again so is my whole house :). What an awesome giveaway this is ... Thanks for the chance to win!!! It would have to be my kitchen. It's stuck in the 70's and I love to cook. Makes for a bad combo. Awesome giveaway...thank you!! What an AWESOME giveaway!! I would do our living room, it is so big and empty. Not cozy at all! WE NEED new couches and I don't even have a coffee table! I've never had one! I would re-do my master bathroom. I have to do it anyways - my 1988 house was built with no shower in the master bath. Ridiculous right? Thanks for the chance to win - so awesome! Only one room? I could tear through half the house with this. I guess the living room, dining room, and kitchen would get the most love with these gifts! There are so many rooms I'd love to redo, but my living room is priority #1! We are having a new baby in September. I would love to re-do our spare bedroom into a new nursery! This is such a great giveaway!! I would LOVE to redo our bedroom and living room! The spaces we use the most and would like to freshen them up! I would love to do the bedroom and living room! I would re-do our office and guest bedroom! i would re-do our kitchen/dining area and living room! My kitchen needs a lot of help. We have builder grade orange wood cabinets...blech!! Probably my kitchen, but maybe my living room or my entry way. It all needs help! I would replace the old lighting in the house at the top of the stairs and in the entryway... then work on the master bathroom! Ooooh, I would definitely work on my master bedroom! my kids bathroom is desperate for a makeover!! I would work on my kitchen. It needs help! I need a bedroom makeover, desperately!! I would love to makeover my family room! Thank you for the giveaway! I would redo my living room. Its lacking my personal touch. What a great giveaway! I would totally make over my main living floor first and foremost! Agghhh such a fabulous giveaway!! Thanks!! The end is near and Baby Girl is almost here! 2013 A New Year–Time for me to say hi!